The English Schoolhouse: How to find an Illustrator...take the road you never do! How to find an Illustrator...take the road you never do! So almost every day I go to the same bar and get either a soy cappuccino or an American coffee and a cornetto. I sit down and make my to-do list that I never look at again for the rest of the day, and then I walk home. Today I followed the urge to explore a street I never really do, Via Margutta, and was delighted by what I found. So the serendipitous thing is that her art gallery wasn't even open. I saw her standing outside and just asked "Posso?" (May I?) and she said "It's not open right now, but sure..."
"Do you like them?" she asked. "Yes, I do," I replied. "Who's the artist?" 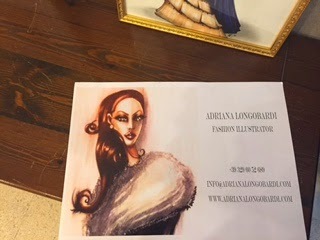 Her sketches reminded me of a book I have in mind about a mom who is a wedding coordinator/wedding dress designer. This book will be principally illustrated by Phil, who I've worked with on several books now, but requires some authentic sketches. "Maybe this is why you took the long way home..." my sub conscience/intuition gently spoke to me. Adriana is lovely and easy to talk to. We eased into a conversation that began with tales of Rome and traveling and trailed into lost loves and disappointments. After I shared that while I love cultures and appreciate each and every one, I don't think in retrospect I'd considered the importance of cultural differences when marrying the first go around. She nodded, and shared that a boyfriend had once broken up with her because he felt that her housekeeping skills weren't up to par for what he needed in a life partner. "Ironed shirts are like business cards," he told her, "I can't go around with a crease in my shirt like this." That **** blew my mind. "Awwwww hell nawwww!" I wanted to scream. But I don't know her like that...yet. So I shook my head and remarked, "Incredibile!" or something like that, in Italian. On the opposite wall of Adriana's sketches you'll find a collection of drawings that she told me were found at her family's home. They are originals of the artist Arnaldo Foresti (1891-1986). Her family is now selling them; they are gorgeous. Arnaldo Foresti was born in Rome on the 17th of September 1891 to a noble family, the Palatini Counts of Brescia. So an hour and kisses and hugs later I found myself with plans to meet for a coffee with a new friend in the near future and to work on this new book, which clearly would like to be written after the two I'm working on right now. At least, that's what the universe says. I was telling Adriana that she's an artist, so she's already an illustrator by default. And one last thing, she does commissioned work! 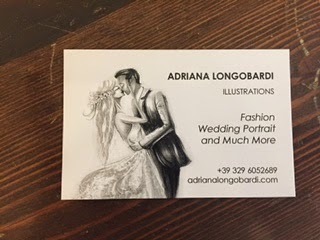 A couple came in while I was chatting with Adriana to get a framed piece of an engaged couple they were going to take to a wedding as a gift this upcoming week. Days like this I'm married to Italy and never leaving.